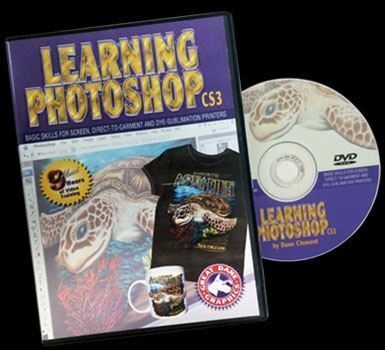 Geared specifically toward screen printing, direct-to-garment, and dye-sublimation, this training DVD-ROM provides more than eight hours of tutorials covering basic skills needed to design T-shirt artwork using Adobe® Photoshop® software. Once you complete all tutorials, you'll have the foundational skills needed to design and prepare your own designs. Lessons are guided by Dane Clement, president of Great Dane Graphics. Clement has been speaking and writing for the decorated apparel business since 1987.